I recently had an opportunity set up an new workspace for myself. I had a delima. I had a laptop with a docking station, a desktop, and MS surface pro with dock (for testing). Each with their own keyboard, mouse and monitor. My first thought was going out and get the traditional KVM switch, but really I didn't want to combine monitors just yet, I wanted share the keyboard, mouse and possible USB headset. Also, I wanted to cut wires and eliminate waste in my workspace. So, I choose to the following pieces of equipment. The setup was easy. Everything was was plug-n-play. It does say that the peripheral switch requires USB 2.0. That was not a problem for me since I have 2.0 and 3.0 available for all the devices. There is a mini-USB DC in 5v on the peripheral switch. I would assume that if needed the peripheral switch can be powered through the mini-USB if you do not have USB 2.0 available on your devices. That would be an additional cost and road that I did not need to got down right now. I connected the keyboard, mouse and headset into the peripheral switch. 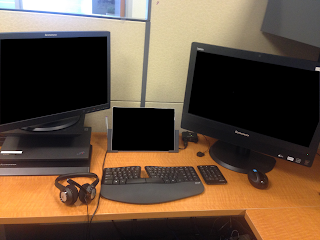 Then the peripheral switch is connected to each one of my work devices (laptop dock, desktop and MS surface pro dock). Using the toggle switch, I can switch my peripherals between each of the devices. It is working pretty well. As you would expect toggling between the device is simple, but there is a little lag. This is tolerable and expected because the USB has to engage to the new device and that will always take a second. Once your realize that, it is a breeze to switch back and forth. This might not be for everyone, but is working for me. I will update as a continue to use this more and more in the next couple of months. What Did We Do Before Text Messaging?